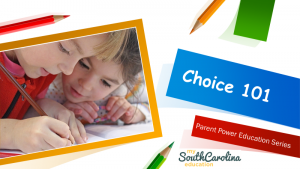 The My SC Education Parent Power Initiative hosted a Choice 101 Webinar on October 11th. This brief webinar introduces a process for identifying the best education options for your children. Ultimately education choice is about you recognizing your child’s individual needs and shaping your research to address those needs. Click Here to view this webinar.